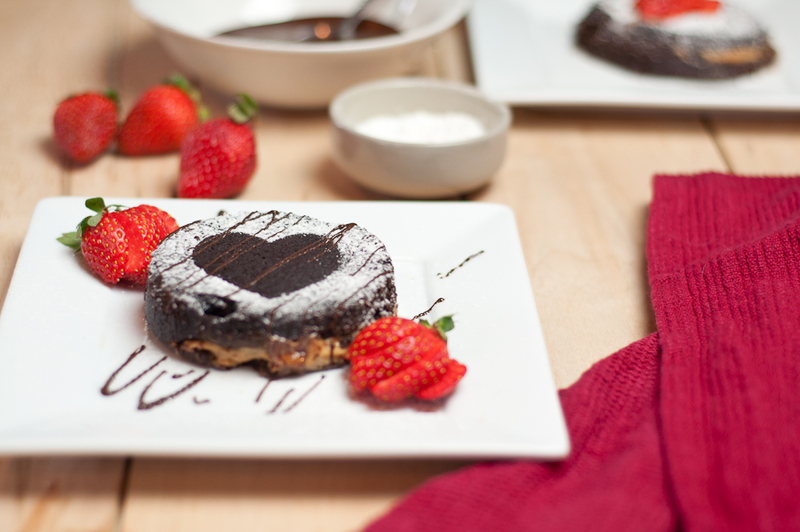 If you’re wanting to surprise your Valentine this year with an ‘in-home’ restaurant quality dish, look no further. 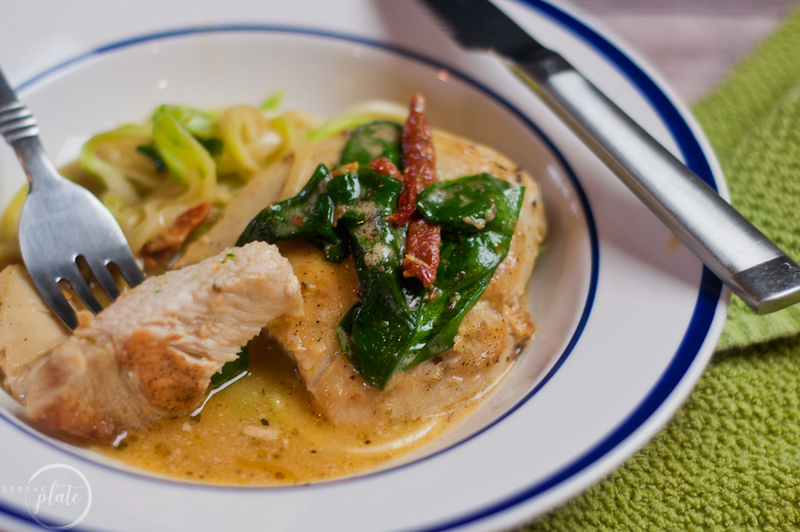 This Keto Tuscan Chicken over zoodles is a pretty easy meal to create. It’s colorful, elegant and tastes amazing! With the added spinach and sun-dried tomatoes, you’re sure to impress your dinner guest(s). Plus, it’s DAIRY FREE! As we all know, I loooooove to cook. Like, legit… it’s my favorite thing. I find myself thinking about what Ill cook next all the time. Recipes flood my dreams. I feed people far too often, and they are not always my immediate family. With all of that said, I also LOVE to go out to eat. It gives me a chance to try new things, be adventurous and NOT have to clean up after. Total bonus, am I right!? 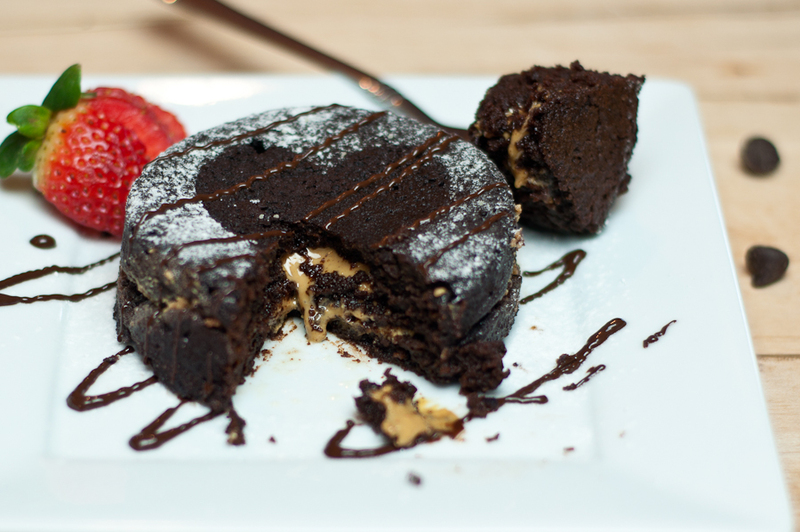 I always thought Valentine’s day was the perfect reason to go out to eat, order something fancy and indulge. But then along came my daughter…going out with a little isn’t as “fancy” as it used to be. So now I get creative and I bring the fancy to my kitchen table instead. 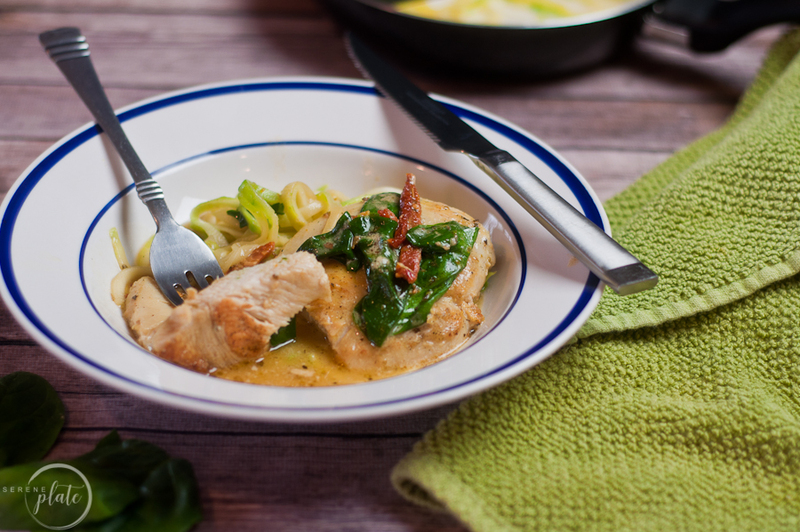 Enter this DELICIOUS Keto Tuscan Chicken! You guys, it is so rich and elegant and the best part, it is DAIRY FREE! With keto, I feel like I eat a LOT of cheese and decided that once a week we are going to eat a dairy free dinner. I do a lot of curry for this reason but I am so glad I ventured out to try this recipe! Feeling bloated or two weighted down after eating isn’t fun, so choosing to be dairy-free once a week helps. The sauce is packed with flavor but is thinner than a traditional cream sauce. Putting it over zoodles is a great pairing too. Since there is spinach in the dish you get your double dose of veggies too. Also, I am not a huge fan of sun-dried tomatoes, but I really liked them in this meal. They added a tang that really brought it all together. P.S. Here is some exciting news for wine lovers too! You can pair this delightful meal with a wine that is SUGAR FREE and leaves no hang-over, icky feelings or head ache the next day. It’s been called the “keto wine“ and it tastes GREAT, trust me, I’ve had my fair share of bottles now and I’ve done my research with the company…they know what’s up. My husband and I are pretty big wine-o’s and Dry Farm Wines has made it possible for us to still have a nice glass with our dinner. PLUS, they offered my followers a smokin deal! You can get an extra bottle for a penny with your first order!! If you're looking for an 'in-home' restaurant quality dish, look no further. 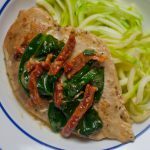 This Keto Tuscan Chicken with spinach and sun-dried tomatoes, over zoodles, is a pretty easy meal to create. It's colorful, elegant and tastes amazing! Plus, it's DAIRY FREE! Measure out 2 Tbsp of the sun-dried tomato oil. Add it to a skillet (I prefer cast iron) and heat over medium heat. Place the chicken in the skillet and cook 3 to 5 minutes on each side. Add the coconut milk, chicken broth, garlic powder, Italian seasoning, and nutritional yeast to the skillet and stir. The sauce will thicken slightly as it simmers. Add the spinach and the sun-dried tomatoes and let the spinach wilt. Place the chicken back in the sauce and let simmer until the chicken is fully cooked through. Blanch your spiraled zoodles in boiling water for a few minutes. You may put them in an ice bath to stop the cooking if you like them more al dente. 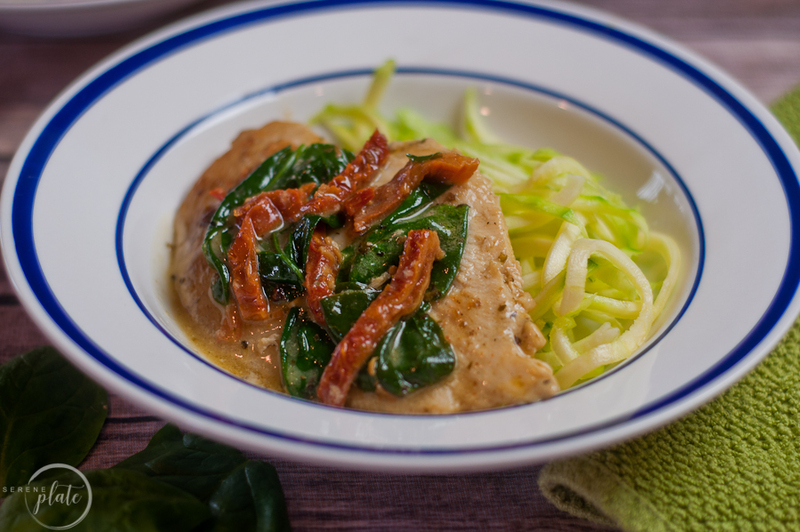 Serve the chicken over your pre-cooked zoodles with a few spoonfuls of the sauce. 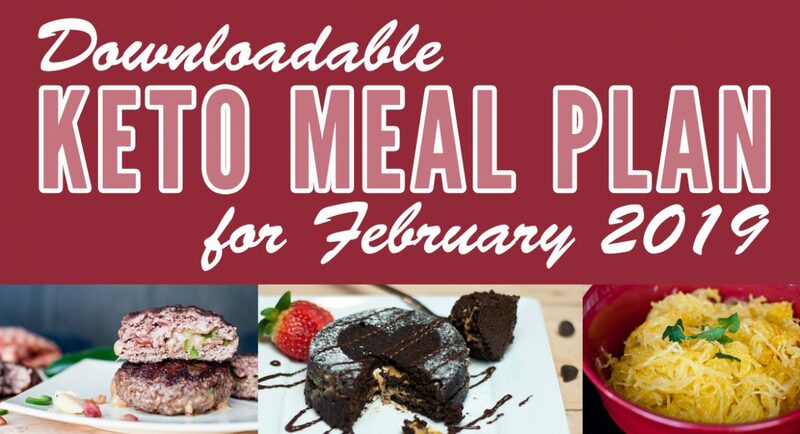 Downloadable Keto Meal Plan for February! 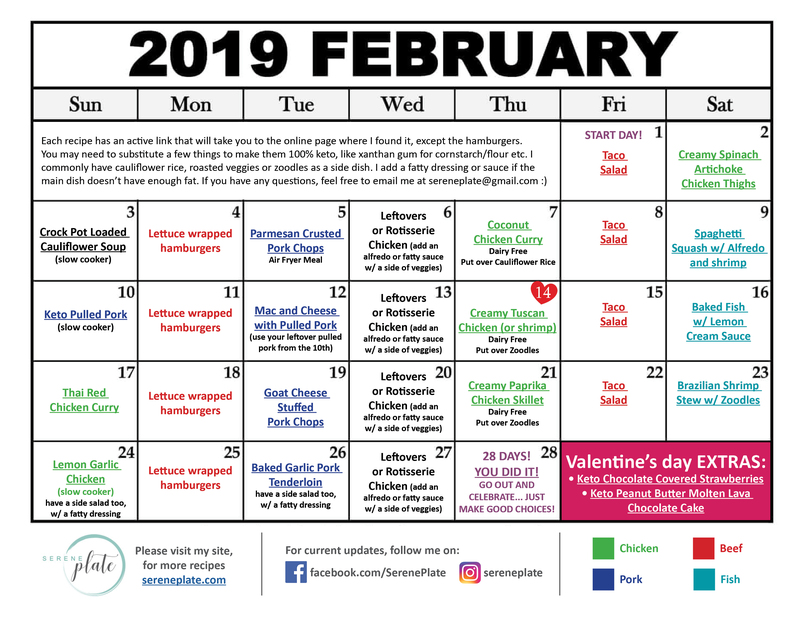 As promised, here is my Downloadable Keto Meal Plan for February! This calendar will set you up to have leftovers, one pot dinners for easy clean up, slow cooker Sundays and even some ethnic flare. 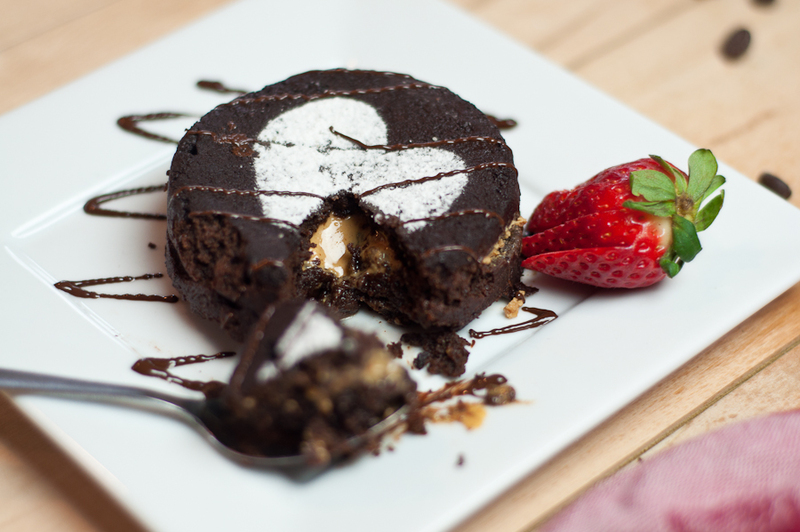 Additionally, I included two wonderful Valentines desserts and a great dinner-at-home option for the 14th so you don’t have to worry about what you can and can’t order on V-Day at a restaurant!! I HAVE to meal plan for the entire month to stay on track. It may sound like a big job, and it is… it takes time…but it’s soooooo worth it for me! In sharing these meal plans, I hope that it helps you stay on track too. Varying my proteins is important to me, I don’t like having chicken back to back. I try to do a bigger recipe on Saturday’s because I have more time to cook and I like to test my culinary skills + it gets my daughter involved in learning to cook. Slow cooker meals on Sundays set me up for the week and it’s an EASY way to make Sunday less stressful. I also double recipes from time to time so I have left overs for our lunches. All in all, this has been a huge help to my family and my sanity. After working a full time job, 30 minutes from my home, the last thing I want to do when I get home is ‘figure out’ dinner or hear the phase ‘what’s for dinner’ uttered… no thank you. So I figured I would share it with you too! I remember being very stuck in the beginning, looking at pinterest to much to find recipes and they all seemed to blend together after a while. I felt like we were eating the same thing over and over. So here are my faves. The meals that we have grown to love! I hope this is useful to you too, enjoy!! 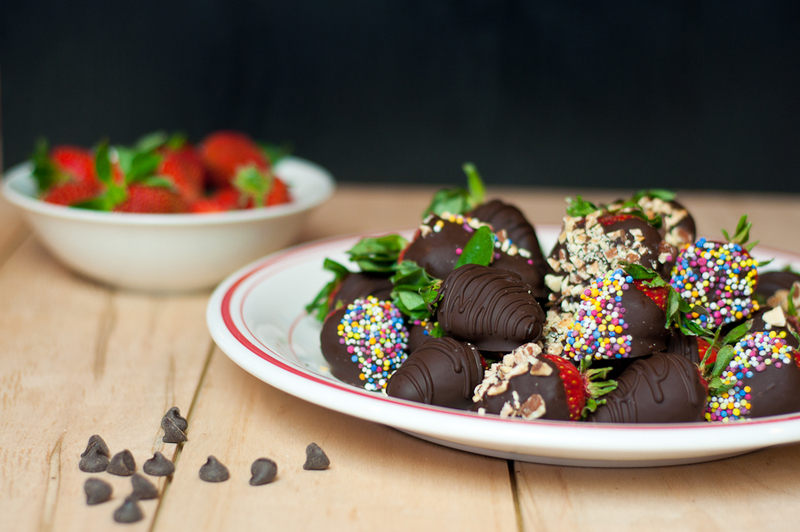 These Keto Chocolate Covered Strawberries are made with sugar free dark chocolate and sugar free sprinkles, that’s a win win in my book! I also added chopped nuts for more texture!! When I think of Valentines day I immediately think of chocolate! 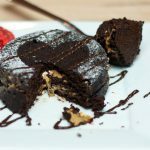 Eating keto can make this a little challenging but I am here to help! I made these keto chocolate covered strawberries with Lily’s Dark Chocolate Premium Baking Chips. They are 55% dark chocolate with NO SUGAR ADDED! I also found an awesome local sprinkles company, Natural Sprinkles, that sells sugar free, dye free sprinkles! Their mission is “doing global good, one sprinkle at a time.” Their products are kosher and halal, and many are sugar-free, vegetarian, gluten-free, vegan and soy-free. You can trust that their sprinkles are free from GMOs, preservatives, hydrogenated fats and artificial additives. Plus, they hand-select fruits and vegetables powders to create vibrant colors for our sprinkles, making them dye-free. 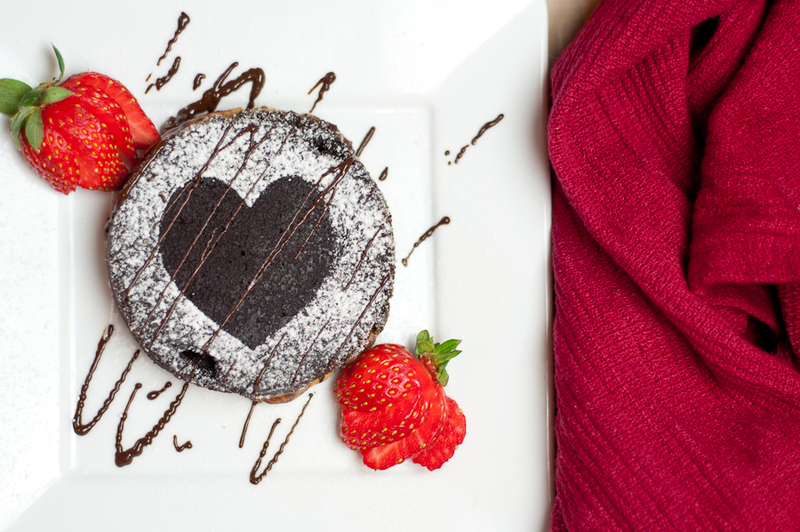 These little beauties are a very simple way to show you’re sweet heart some love on Valentines day. Or better yet, they can be a nice treat for just you! I love when the chocolate pools a little once they are set down to harden… it just gives you that much more yummy chocolate to bite into! The toothpicks are super helpful when dipping. If you just dip the strawberries using the leafs they can break and the entire strawberry does a death defying dip into the chocolate! This often leads to more ‘eating of the rejects’ than having a nice plate full of berries at the end. I dip a few berries in plain chocolate too and once they’ve hardened I put some melted chocolate in a sandwich baggie, snip off the tip and drizzle little lines on top. This creates a nice neat design to break up the ones that are covered in toppings. Look at Natural Sprinkles super cute packaging! They ship all over too! 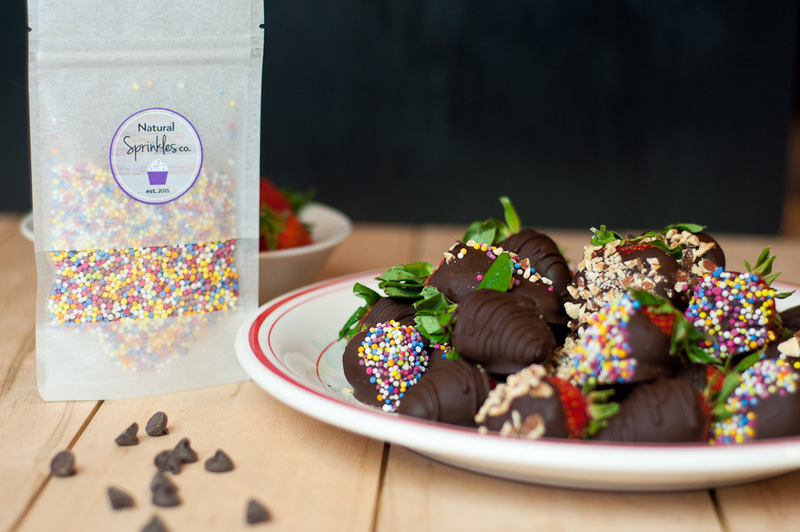 These Keto Chocolate Covered Strawberries are made with sugar free dark chocolate and sugar free sprinkles, that's a win win in my book! I also added chopped nuts for more texture!! For added 'hold' stick toothpicks into the strawberries where the leaves are. 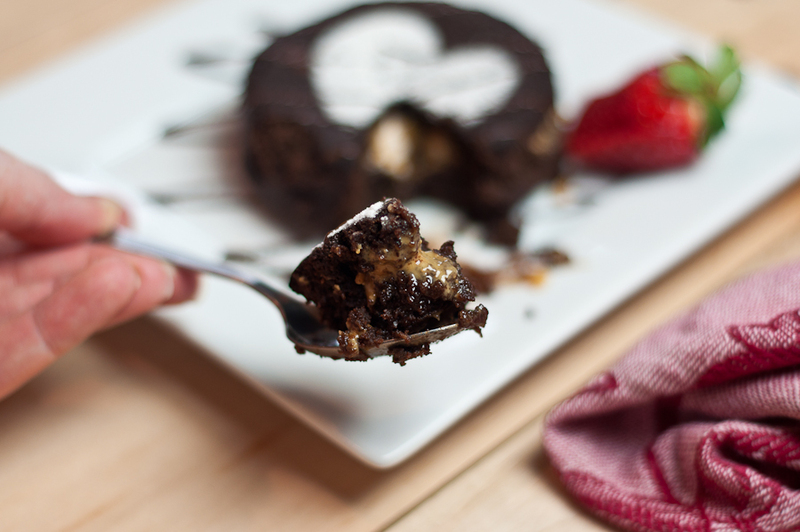 Melt the chocolate and coconut oil together in a microwave safe bowl. Do this in 20-30 second spurts. It can take 3 times to melt completely. Once out of the microwave, if there a few chips still not melted, just stir the mixture. The surrounding chocolate will be warm enough to finish the melting process. 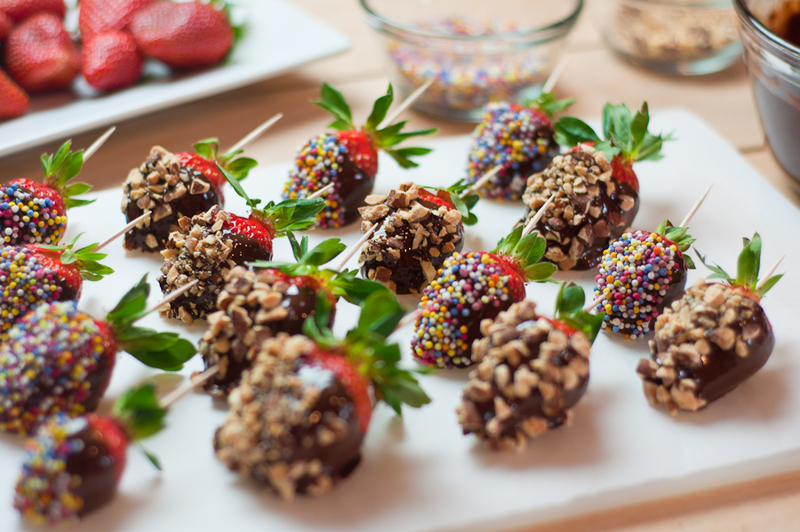 Dip one strawberry at a time into the melted chocolate. Let some of the excess chocolate drip off. 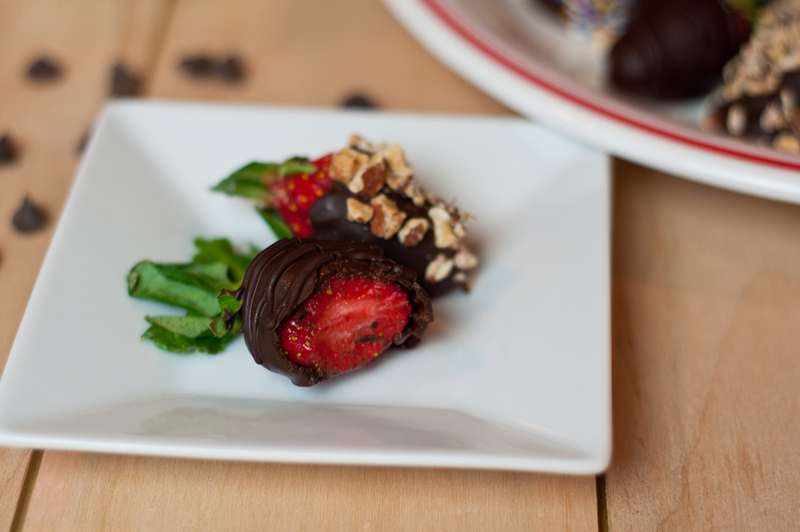 Lightly touch each strawberry to your desired topping. 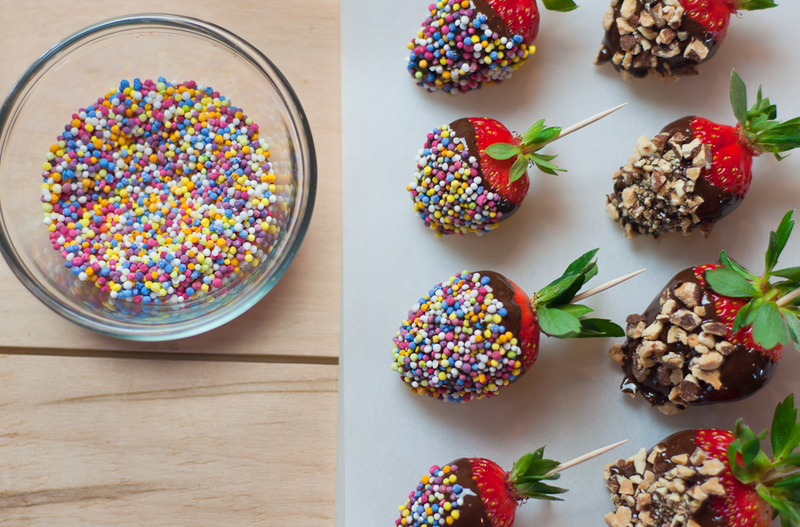 Set each strawberry on a parchment paper lined pan or cutting board to rest and harden. 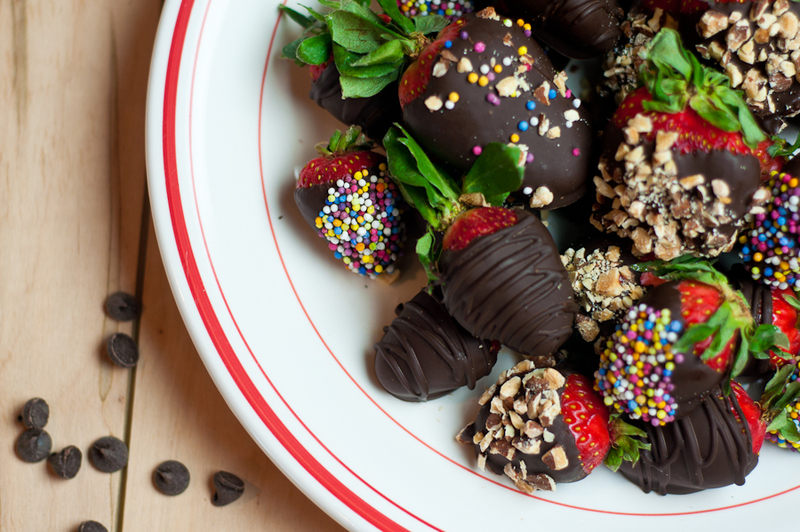 It's best to eat these keto chocolate covered strawberries the day of (if hardened enough) or the next day.